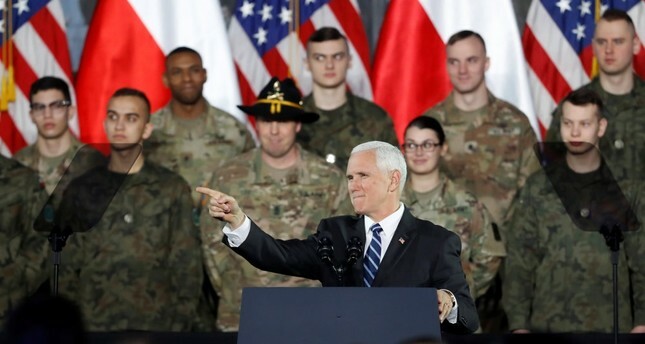 U.S. Vice President Mike Pence gestures during a speech, Warsaw, Feb. 13, 2019. A high-profile summit organized by the United States in Warsaw began Wednesday with a focus on peace and security in the Middle East, although the summit may also be seen as part of the Trump administration's foreign policy goals in Central Europe. Ahead of the Warsaw summit, U.S. Secretary of State Mike Pompeo embarked on a tour of the region with a visit to Budapest, aiming to re-engage with the region. In addition, the U.S. plans to deploy more troops in Central European countries surfaced once again. In an interview with the Financial Times, U.S. Ambassador to Poland Georgette Mosbacher, stated that the U.S.' 4,000-strong troop presence in Poland would increase, without mentioning the establishment of a permanent military base, which may be called "Fort Trump," as Polish leaders suggested. The recent developments show that the four Visegrad Group countries – Poland, the Czech Republic, Slovakia and Hungary – hope to strengthen their ties with Washington. This would also allow the U.S., by bypassing the Paris-Berlin axis, greater influence in the region on issues where the key European powers strongly oppose Trump's policies. Asked whether the U.S. would benefit from repeated clashes among European countries, Ali Faik Demir, an academic at Galatasaray University said: "At this point, it should be considered whether [the Visagrad countries] would accept becoming the U.S.' Trojan horse in Europe." As the gap deepens between central European countries and Brussels, Demir stressed that these countries should be aware of the U.S' long-term strategy in its foreign policy, as they may risk greater isolation in Europe. The Warsaw summit comes amid a variety of important tensions and inconsistencies, especially over Iran. Considering Europe's differences with the U.S. over Iran, European diplomats remain skeptical over the summit, as it was initially billed by Trump's administration as an Iran-focused meeting. Several Western European foreign ministers are staying away from the conference as Iranian officials were not invited to the summit. The EU remains strongly supportive of the 2015 Iran nuclear deal that was abandoned by the U.S. It has also devised a preliminary trading vehicle to continue trade with Iran, in defiance of U.S. sanctions. The presence of leading Gulf states, as well as Israel's Benjamin Netanyahu in Warsaw shows that the anti-Iranian stance has brought them together, as the U.S. aims to expand its anti-Iran coalition, toward Central European countries; areas the U.S. is concerned Russia and China have ratcheted up presence in recent years.